Vegan Bytes #35: It's So Close We Can Almost Smell It... SPRING! One of the enormous privileges I've had over the course of my journey with Vegan Nutritionista has been the chance to see people change and grow, often through the simple decision to change their diet. Recently, there has been an influx of people telling me they want to go vegan in my life, and I couldn't be happier. This reminds me of what happens after a long, hard winter, and in a time when the health benefits of a plant-based diet are all over the media; we've just come to a point where people are really ready for a change. We want the rejuvenation and the hope of the future that comes with spring. If you're a vegan reading this newsletter, you've probably also had the chance to change lives with your positive words and responses to basic questions. I hope you see this as an honor, like I do. And, I hope that you won't be too harsh or judge their slips too quickly. While I recognize that it is simple to stop eating animal products, it can still be difficult. Yes, that's right. It's hard to do something totally new and out of your comfort zone, and most people never even attempt that type of change. You can't force change on others. They will only make a real difference in their life when they decide for themselves, and that's when you have you chance to make an impact. So, when someone even considers changing their diet, I applaud them. When they ask for help with a particular facet of veganism, I am excited for them. But it's when they actually start making change that I am truly proud. During this late winter/early spring time of the year, I suggest a gentle approach. When people ask why you're vegan, give a compassionate and honest response, and remember the time before you were educated about the benefits. When someone tells you they want to go vegan, ask how you can help. And, when they start eating vegan, applaud them heartily with as much positive reinforcement as you can find within. After that, it's easy. Keep suggesting new fruits and vegetables, whole grains, beans, tell about your favorite books and movies, and share your favorite recipes, helping them learn to cook if they need it. And if they bounce back to the animal side, just remember that it takes time to make a full change in your life, and even if they only stayed around for a few months, that was a few months of a healthier body for them, a healthier planet for all of us, and temporary freedom for suffering animals. Follow Mahatma Ghandi's words and "...be the change you want to see in the world." Last month I told you about my exciting interview with CNN HLN's host Jane Velez-Mitchell. But, I sent you the wrong link! So sorry about that. After the number of emails I received from people trying to access the article, I thought it was important enough to include the correct link this month. Here's the updated and correct link to my interview with Jane Velez-Mitchell. This question is perfect for those of you who enjoy gardening and are getting ready to buy potting soil and topsoil, and are considering composting. Is it possible that all the plant based foods I am eating are grown in soil that uses decomposing animal products?? How can I be vegan and avoid this problem? Are fertilizers vegan? This is a very good question, and one that I had a few summers ago as well. I was starting a vegetable garden on my deck and looking for potting soil that wasn't made with bones and blood, or any synthetic chemical fertilizers. Seems simple enough, right? Well, I was wrong. Every bag of fertilizer I found at every store, big brand names and small mom-and-pops, all were made with some type of animal product or chemical. Unfortunately, because we are talking about such huge demand here, the suppliers use what is absolutely the cheapest formula on the planet for those potting soils. That happens to be animal bone remnants from factory farmed animals (blood, bones, fish particles, etc) and the cheapest synthetic fertilizers, pesticides, and herbicides available. The same is true of the fertilizers used on the crops we buy. Big corporations have squeezed out small farmers nearly to the brink of extinction and most of what we buy in stores is now made on enormous farms that don't resemble Old MacDonald's farm in any way. You might think, "well, I'll just buy organic produce." Unfortunately, the term "organic" doesn't hold as much weight as it used to. There are tons of loopholes and exceptions made to include as many farms as possible in the organic wave. Depressing, I know. There is some hope. When I was researching it long ago, I found that there are vegan soils and farmers who grow their crops exclusively in that type of soil. A little google searching should help you look to see if you can find vegan fertilizer. Also, if you have space and the inclination, you can grow your own produce. More and more it seems the best way to control our food chain is to be completely in charge of it ourselves. Then we know exactly what goes into our food and where it's coming from. To solve the dilemma of looking for soils at a store, you can start a compost bin. We got a counter-top compost bin like this one from Amazon that we fill with our veggie scraps each day and then dump a few times a week into a pile in our backyard. I am so shocked to see how much compost we actually make, and how nice that soil has become outside. Compost is like magic dirt and you can grow absolutely anything with it, so I highly recommend it for gardeners. Free vegan fertilizer! And then, you aren't making as much trash to throw onto trash heaps. 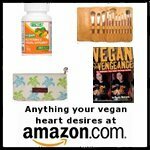 We have a lively and fun section on Vegan Nutritionista about what prompted our readers to go vegan. I love to hear about your lives and what inspires you, and it amazes me to see all the different parts of the world represented in the new wave of veganism. Here are some of the latest posts on why readers went vegan. Jackie was looking for a life change. Valerie read Slaughterhouse and immediately dropped animal products. Similarly, Amanda read Eating Animals and stopped eating animals. And Claire responded openly to her daughter's wishes and has gone vegan with her. 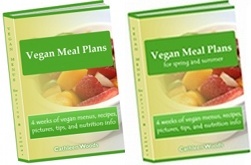 Want to join in the fun and help to inspire aspiring vegans all around the world? Why did you go vegan? The more detail you can share, the better. As you're writing, think of those people who doubt you and really brag to us about how you feel now. In the spirit of what seems to be spring finally peaking out her head, I want to give one last homage to winter meals with the featured recipe this month. I've found that recently all I do is I take a long look into our fridge, pull out veggies, cook up grains, and throw a bean with it to make a full meal. For some reason winter brings out the boring (but nutritious) cook in me. Especially right now, while I'm staring at my new mini greenhouse that is going to house a million little heirloom tomato seedlings in a few short weeks, all I can do is think about peppers, tomatoes, crisp romaine lettuce, fresh kale, strawberries, and blueberries. Summer is just my favorite time to eat. So, I just humor this part of winter, accept it for what it is, and make the best of it with some killer soups and roasted root vegetables. This recipe comes from that general school of thought. For that last cold winter night, a pot pie is perfect. If you make extra, you can even save extra pies in the freezer for a night you don't feel like cooking. Don't worry if you don't have every one of the vegetables listed here-- pot pies are made to be experimented with. Once you know the basic steps, you truly can use any vegetables you have in the fridge, and those root vegetables (butternut squash, acorn squash, potatoes, carrots, and beets) really give a veggie pot pie a boost. I personally don't feel like a pot pie is authentic unless there are peas in it for some reason, so I'll always go pick some up to put in it, but that may just be me. Directions: To prepare the crust, mix flour and salt together, cut in shortening, add the water, then shape into a ball and chill. Once it's chilled roll out the dough to fit the casserole dish. Preheat oven to 375º F. Saute celery, onions, and carrots in butter for 10 minutes. Add the flour, stirring constantly for 1 minute. Add broth and milk to mixture while stirring constantly. Cook over medium heat until bubbly then stir in the peas, edamame, salt, and pepper. Pour into a 2 qt casserole dish and top with crust. Bake for 30-45 minutes until golden brown. Let it sit for 20-30 minutes when it comes out of the oven so the filling will have time to thicken. Until the end of the December 2010, SBI is running a buy-one-get-one special on sites. It's their best deal of the year! You can use it to start two sites, or split the price with a friend who also has a hobby they love to death. And don't forget, a percentage of all Vegan Nutritionista profits go to a rotating group of charities that benefit animals. Last year, we donated to Vegan Outreach and to start off this year we donated to Physicians Committee for Responsible Medicine.